There’s never been a better time to be a PC gamer. The gaming scene is vibrant: envelope-pushing graphical powerhouses look best on the PC, and it’s the first stop for independent developers making creative and innovative games. And building a great gaming PC has never been cheaper or easier. But, we admit it—if you’ve never built a PC before, it can still be a little intimidating. But it’s easy. We promise. And we think you should build your own gaming rig, even if your last gaming PC was a great system from a custom rig-builder. 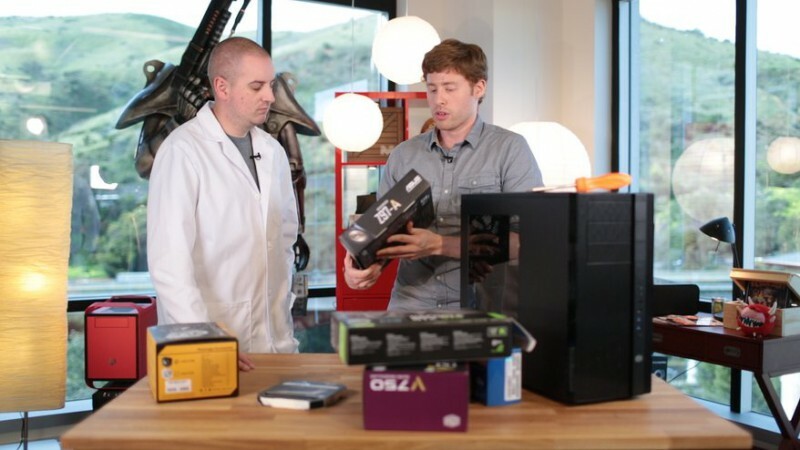 If you’re ready to take the plunge and build your next gaming PC, we’re here to help. This is our step-by-step guide to building your own PC, with video embeds illustrating each major step of the process. Seriously, putting together your PC isn’t much tougher than putting together a model kit or a big Lego set. Avoid static electricity! Build your PC on a table or some flat surface away from carpet. Ideally, dispel any built-up bodily charge by touching a grounded metal object before you touch sensitive PC components. As long as you’re not rubbing your socked feet back and forth and building up a static charge, you’re probably fine. Open up your motherboard manual to the diagram page that shows a layout of the motherboard. If you ever get confused about what goes where, the labels on this page should help you sort it out. For this build, we’re using the following components. Your build will likely differ slightly, but but most of the steps below are universal and will look and function very similarly. Remove your motherboard from its anti-static sleeve and place it on a clean, flat surface, where you’ll be doing your build. Remove the protective plastic covering over the CPU socket on the motherboard by pushing the lever arm down and to the side, then pulling the covering up. Now you’re ready to install the processor. Open your CPU box and take the processor out. It’s probably safely housed in a plastic sleeve. Look at the CPU, and match the arrow on the bottom-left corner of the chip with the bottom corner of the socket. There are also two notches on the top half of the chip. The pins face down, so the plain silver side should be facing up. There’s only one possible way to correctly orient the CPU, which makes it easy to install! The CPU fits into the socket, and you don’t need to press down to force it into place. It doesn’t “snap” in—it just rests on top of the pins. To finish the installation, simply lower the socket covering and push the lever arm back into place. Ready for what is (usually) the hardest step of your build process? Everything from here on is a total breeze, but installing a CPU cooler can be a bit tricky, especially because they vary in design. For this step, you should primarily be following the steps shown in your CPU cooler’s included instructions. But I’ll walk you through two examples: installing the stock Intel cooler included with Intel’s processors, and installing the popular Cooler Master Hyper 212 Evo, our recommended air cooler. Stock Intel cooler: This little guy will keep an Intel processor cool enough if you’re not doing any overclocking, but it’s not as quiet or efficient as an aftermarket cooler. Its greatest strength, however, is simplicity. If you look at the bottom of the cooler, you’ll notice it already has thermal material on it. This means you don’t need to add thermal paste to your CPU. Intel’s cooler is also easy to mount. Simply place it over the CPU socket, oriented so that its labeling faces the same direction as the text on the processor. The frame of the socket is the top, while the lever arm juts down to the bottom. Push the cooler’s pegs into the four holes surrounding the CPU socket until they click into place. Cooler Master Hyper 212 Evo: This cooler takes a bit more work. First, find the CPU mounting plate (aka back plate). You need to install this plate to the backside of the motherboard to provide extra support for the cooler. Refer to the instructions to find the proper screws and backplate positioning for your motherboards, since the mounting positioning can vary slightly between sockets. But lining it up should be easy—there are four holes around the edges of the CPU socket, and that’s where you’ll be placing screws to attach to the backplate on the backside of the motherboard. Hold the backplate in position so its mounting holes line up with the holes around the socket, then screw it into place from the top side. With the backplate securely in place, you’re ready to install the cooler. Unclip the fan from the radiator to make it easier to install. Now flip the radiator over so that the small side, with copper piping, is facing up. There should be a clear plastic covering on this surface to keep it clean. Remove the plastic and apply a pea-size dab of thermal paste to the middle of the surface (I did a sloppy job in the video above: you can use about half that much thermal paste). You don’t need a lot, and you don’t need to spread it around—pressing the cooler onto the CPU will do that for you. Ready to put it in place? Orient the cooler vertically over the CPU socket (the socket is taller than it is wide, so you should orient the cooler to match) and press it down firmly on the CPU. Make sure it’s on straight. Home stretch: look at the CPU mounting bracket, a crossbar with spring-loaded screws on the ends. Reference the instructions to make sure those screws are positioned properly for your motherboard socket. Then, with the bracket closed, slip it in the gap between the radiator and the contact point of the cooler. There’s a little peg hole here that the center of the bracket nestles into. Push it into place, then spread the two arms out and position the screws into place over the four mounting screws you installed earlier. Screw them in, and you should feel the cooler tighten up against the motherboard until it’s held solidly in place. Reattach the fan to the heatsink simply by clipping it into place. You’ve now installed your CPU cooler. This step is easy. So easy. Take your RAM sticks (you probably have two or four) out of their packaging. Before installing, refer to your motherboard manual’s page about the RAM slots. This page will tell you which RAM slots are the ideal slots to use based on how many sticks you have. These slots are usually color coordinated. Once you know where you’re putting the RAM, unlock the slot by pushing down on the hinged tabs on one end. Orient your RAM so that the notch ⅓ of the way through the stick matches with the notch on the slot. Now press the RAM sticks firmly into the slots. Don’t worry about pressing too hard—it takes some pressure. The tabs will click into place when the sticks are fully inserted. Time to open up that shiny new PC case you bought. Opening it is as simple as undoing the thumbscrews at the back of the case that hold the panels in place, and then removing them. Now lay the case flat on your table so that the main cavity faces up. Your motherboard should’ve come with a rectangular plastic or metal I/O shield that fits over the motherboard’s input/output ports. To install the I/O shield into the case, first orient it correctly in relation to the motherboard, then fit it into the rectangular slot at the back of the PC case. You’ll have to press it firmly into the slot from within the case; they can be finicky to install, and the edges are sharp, so watch your fingers. Press against each side of the I/O shield until it gives you a solid snap. Your case should’ve come with a box or bag full of screws, zip-ties, and other odds and ends you’ll use for installation. Find the motherboard standoffs—the bottom halves of the standoffs are threaded, while the top halves are screw holes that you’ll be screwing the motherboard into. Now examine your case. There should be about a dozen small holes around the inside of the case where the standoffs go. Depending on your case, they may be labeled for different size motherboards: A for ATX, M for micro ATX, and I for mini ITX. Depending on the size of your motherboard (in most cases, you’ll be building with a standard ATX size), you want to put the standoffs into the correctly labeled holes. If they’re not labeled, you should have enough standoffs to simply cover every hole. Screw them into place using the included standoff tool, which fits over the standoff and lets you use a screwdriver. With the standoffs in place, it’s time to screw in the motherboard. Orient it so that the I/O ports line up properly with the I/O shield, then lower the motherboard until it’s resting on the standoffs. Most cases have a peg that fits up through a hole in the center of the motherboard, so if you have it properly positioned, it should now be locked into place. Once the motherboard’s placed, find the motherboard screws that came with your case and tighten that mother down. Another easy step. Take your power supply out of its box and set aside all the cables, which you’ll be using a bit later. Depending on the model, the power supply may be completely modular (in which case, no cables are permanently attached) or partially modular (primary motherboard power cables are hardwired in) or not at all modular (a whole big mess of permanently attached cables). Regardless, this step of the installation process is the same: you’re going to put the PSU into the case, usually at the bottom, so that the rear vent and power plug and on/off switch face out of the rear of the case. Depending on your case, you may have the option to orient the power supply face up or face down. See the big fan on top of your power supply? If your case has a vent at the bottom, you can orient that fan down to pull in cool air from below the case. But don’t orient the PSU downwards if your PC will be resting on carpet. The fan needs clear airflow. If your case doesn’t have that ventilation at the bottom, simply orient the power supply so that the fan faces up, into the case. With the power supply nestled against the back of the case, find the power supply screws that came with your case and screw it in tight. You’ll probably need to push against the power supply from inside the case to make sure it’s snug. This step will vary a bit based on your case and what kind of storage you’re putting into your PC. A pretty standard configuration these days is an SSD for your Windows installation and games, and a HDD for bulk storage of media. In a typical case, there are convenient hard drive trays that slide in and out, or plastic runners that snap onto the sides of the HDD. If it’s a tray, it probably mounts onto the bottom of the hard drive. Orient your HDD in the tray so that its ports face out of the back of the tray. This will allow you to run cables to it on the backside of the case, and keep the interior cavity nice and clear. Now find the HDD screws included with your PC case parts and screw the HDD to the tray. Then simply slide the tray back into its slot, where it should fit with a nice click. Runners are even easier: just snap them to the sides of the HDD and then slot it into an empty space in the hard drive cage. SSD mounting methods vary: some cases now have dedicated 2.5-inch SSD slots, while others use adapter trays to fit the SSD into the same part of the case as the HDDs. If it’s a tray, the installation will be similar to a hard drive. Refer to your case’s manual to figure out how your SSD should be mounted. Once you have all your drives installed, it’s time to plug ‘em in. Find the SATA data cables included with your motherboard, and plug those into the small SATA ports on the drives. The SATA port is notched, so the cable can only fit in one way. After the SATA data cable comes the SATA power cable. These cables may already be attached to your power supply—there are usually plugs attached to a single cable, and you should have several extras included with the power supply. If your HDD and SSD are installed close together, you should only need one cable to power them both. Find the cable where it’s connected to the power supply, pull it through one of the cable management openings along the wall of the case, and plug in both the SSD and HDD. Like the SATA data cables, these are notched, and can only plug in one way. Final step: your SATA data cables are probably just dangling from the drives right now. Thread them through one of the cable management openings into the main case cavity and plug them into the SATA data ports on the motherboard. They’re usually located on the right side of the board, conveniently close to a cable management opening. Which port should you use? All of them should work fine, but refer to your motherboard manual for information on the SATA controller. It will tell you which ports belong to the motherboard chipset (I’d recommend using those) versus a third-party SATA controller. You’re in the home stretch! For this step, open up your motherboard manual to the layout page, because you’ve got a bunch of cables to plug in. There should be a big wad of cables somewhere inside the case, which control its built-in fans and external power and reset buttons and front panel USB and audio ports. Most of them are small pin connectors that plug in at the bottom-right of the motherboard. They’re all labeled, so plugging them in is as simple as reading your manual and figuring out what goes where. From the power supply, you’ll also need to plug in two cables: the large, primary ATX 20-pin molex power cable plugs into the motherboard to provide power. And ATX motherboards also need a secondary 6-pin molex power cable up near the CPU. To plug in that cable, you may want to run it around the back of your case and through one of the cable management slots near the top. If it’s too short, you can thread it around the side of the motherboard and CPU cooler. Just don’t stretch it across the center of the cavity, as that’s where we’ll be placing the graphics card momentarily. With the motherboard powered, the last plugs you need to attach are fans. First, make sure your CPU cooler’s fan is plugged into the port near the CPU socket. Then make sure all your case fans are plugged into their nearest fan power pins. Those should be visibly labeled on the motherboard, but again, refer to the manual to make sure you place them properly. Here we are: the final step before your gaming rig is fully operational. Find the first x16 PCIe slot on your motherboard—the long slot closest to the CPU socket—and remove the expansion slot cover plates to the left of it. Most video cards use a dual-slot design, which means you need to remove the cover plate directly left of the PCIe slot, and the one above it. To take them off, simply unscrew the thumbscrews and slide them out. Now align your graphics card’s PCIe PCIe interface with the slot and press it into place. When it’s slotted in, re-insert the thumbscrews you just took out to keep the graphics card strongly locked into place. All that’s left is to feed it power. Your power supply probably already has two six pin molex power connectors plugged in, unless it’s a fully modular design. If it is fully modular, find those cables in your supplies, plug them into the PSU, and then plug them into the graphics card. Depending on how much power the card needs, you might also have to plug in the extra 2-pin attachments that can fit snugly against the 6-pins. With your graphics card fully powered, you’re ready to game. Don’t completely close up your case just yet. Before you do, you should test if your computer is working as intended. Plug in the system and attach a monitor (make sure you plug the monitor cable into the video card) and a keyboard, the bare essentials for testing if the system will boot. Then make sure the power switch in the back is in the On position, and press the power button. If the computer turns on, that’s a promising start! If you see the BIOS screen pop up on the monitor, that’s even better. If you get any kind of error message here that doesn’t immediately make sense, Google’s probably your best resource. It could also be an issue common to your motherboard, so you can try searching for the error message plus the name of your motherboard. If nothing shows up on the screen at all, or the system doesn’t turn on properly, the most likely issue is with your cables. Double check that everything is plugged in where it needs to be (don’t forget the molex power cable that runs up to the CPU socket! ), and make sure nothing is loose. With a little jiggling, you’ll likely have a working PC!